The beautiful San Juan Islands in Washington State is an architectural playground for Olson Kundig Architects, and their False Bay Writers’s Cabin adds to their oeuvre of kinetic design. 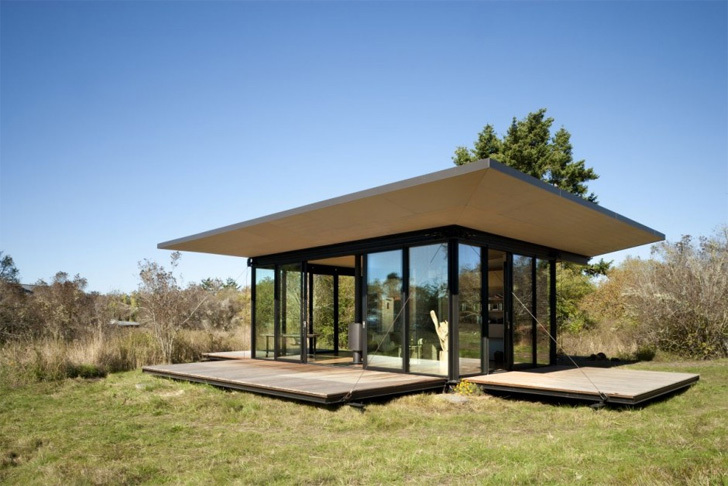 Modern and minimal, the small, glass-shrouded building also boasts a small secret -- its wraparound decks can pivot up and encase the cabin. This nifty trick allows the home to better create an immersive experience on its site and gives the owners the chance to close up the homes when a storm rolls in or when they leave. We have seen similar tricks like this before, most notably in the Australian outback, and the concept is extremely useful as it serves multiple functions with one design gesture. When the wooden slate decks are down they gracefully extend the living space to the outdoors in three direction, and the generous overhanging roof creates a protective canopy. When they are set to the up position using the hydraulic and cable and block system, they act as robust shutters. When inclement weather takes hold, the glass walls are protected from the brunt of the winds and rain. The shuttered building is also a degree more secure for privacy. The interior boast a grand floor-to-ceiling view, making the 500 square foot space feel much larger than it is. Lots of windows are vital for good light in the often overcast conditions in Northwest Washington. A small kitchenette and and bath are tucked behind the steel clad section. 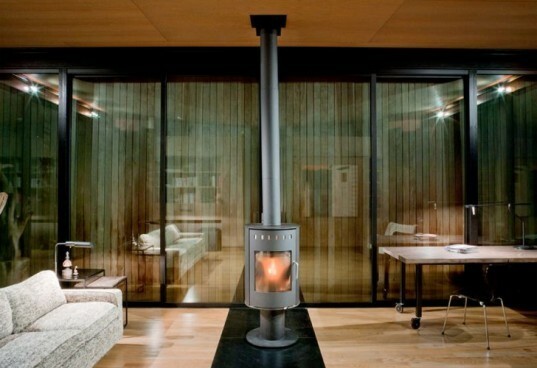 The center piece is a rounded freestanding fireplace, which seems to be ubiquitous in rural architecture in the state, and can be enjoyed from both inside and out when the doors are opened. We have seen similar tricks like this before, most notably in the Australian outback, and the concept is extremely useful as it serves multiple functions with one design gesture. When the wooden slate decks are down they gracefully extend the living space to the outdoors in three directions. The generous overhanging roof creates a protective canopy. When they are set to the up position, using the hydraulic and cable and block system, they act as robust shutters. Details of the shutter system. When inclement weather takes hold, the glass walls are protected from the brunt of the winds and rain. The shuttered building is also a degree more secure for either privacy or natural events. The interior boast a grand floor-to-ceiling view, making the 500 square foot space feel much larger. Lots of windows are vital for good light in the often overcast conditions in Northwest Washington. A small kitchenette and and bath are tucked behind the steel clad section. The center piece is a rounded, freestanding fireplace which seems to be ubiquitous in rural architecture in the state, and can be enjoyed from both inside and out when the doors are opened.